Event Director Bill Clemons wanted to start shaking things up on Thursday morning with a 5 part task; Minimum Distance Double Drop, Judge Declared Goal, Judge Declared Goal, Judge Declared Goal, Hesitation Waltz. The direction the pilots would be flying meant the target locations would be familiar as they were once again flying out of the Northwest, however the steering required pilots to go high between each target to get the consistent right turn. The minimum was the well known Clemons double drop where one triangle was at the first JDG and the second triangle was located at the HWZ. This task definitely helped shake things up as only 5 pilots were able to get into two triangles. The first Judge declared was located at the main field with the large scoring area, however with the inconsistent lower winds, only 42 pilots were able to make their way to the into the scoring area. The second JDG was located in the same front yard the pilots had flown to as their second target on Monday morning. With a 300 foot scoring area and pilots having to go high to get the turn 35 pilots were able to attain scores. The third JDG was once again located at the wetlands on the narrow mowed path, with a scoring area of any mowed area within 500 foot. This task left most of the field frustrated except the 14 pilots who were able to get their markers into the mowed area. The final task of the morning once again helped to serve the purpose of shaking things up as only 22 pilots were able to make their way to one of the two target locations for the HWZ. Leading the pack after the third flight was Maury Petrehn. Maury is very familiar with the top of the Indianola leader board with multiple wins at the event. Hot on his heels were Brandon Bloom and Tom Forenz. On Friday morning the officials were about to open the doors to the briefing when they let off one last pibal to see that the winds had switched dramatically since they laid out the morning's tasks. After some scrambling the officials opened the doors where pilots found a three part task laid out; Maximum Distance Double Drop, Judge Declared Goal, Hesitation Waltz. When pilots headed out to find a launch site the winds were still switching and it looked as though only one of the three possible HWZ targets would be attainable. The Max Distance was located at the main field using a white and a yellow marker, both to be placed anywhere within the large scoring area and the yellow marker would also serve as the marker for the JDG. Many pilots were left frustrated only getting one of the two markers into the scoring area, 37 pilots received scores on the Max and 41 received scores on the JDG. Pilots fond themselves climbing to around 2,000 feet to find the needed right turn to reach the Northern most HWZ target. Once again scoring proved difficult as only 37 pilots were able to achieve scores. After the flight Al Muir once again found himself holding the number 1 banner with Brandon Bloom in second and Tom Forenz in third with only one flight remaining. Saturday morning would be another shake up morning with the task sheet showing four parts, Fly In, Judge Declared Goal, Judge Declared Goal, Judge Declared Goal, all gravity with a 300 foot scoring area. The pilots would be flying a direction they hadn't flown all week and a 1,000 foot PZ would leave pilots debating on what line to take into the Fly in task where the target was placed in a small back yard. Over half of the field was able to achieve scores on the Fly in. The second target, the first JDG, was located at the main field and saw the majority of the field achieve results. As pilots made their way to the third target the winds started to change as the the larger portion of the pack got to the target and only 27 pilots were able to get into the scoring area. The final JDG only saw scoring mostly from the pilots who got up early and were well ahead of the rest of the pack as only 21 pilots were able to score on the target. At the end of the week there had been 5 flights, 20 tasks and a pretty close race for the win. At the banquet the following awards were given out; Land Owner of the Year - Tom Jones, Jon Russell Award - Bob Shelton, Crew of the Year - "The Miklus Kids" Willie, Tim, Erin and Sean (the crew of Devin Burnham and Benji Clemons), Presentation of the plaque to be placed on the "West Tower" (announcer's tower) to the West Family, Rookie of the Year - Kim Wooge. The top 3 finishers were First Brandon Bloom, Second Jon Shelton, Third Al Muir. After the Awards Race Director Clemons was asked to return as Race Director in 2014. Sunday morning kicked off the start of the National Balloon Classic with a 4 part task; Fly in, Minimum Distance Double Drop, Judge Declared Goal, Hesitation Waltz. With a thin left turn that seemed to be diminishing and limited launch sites in the area, most pilots launched from one of three spots having to ride the left turn into the target. The minimum distance was at the main field utilizing the incredibly large scoring area that Race Director Bill Clemons and his group of officials have used the last few years. The scoring area was divided into four quadrants and pilots were required to drop their markers in two opposite quadrants to receive a score. Even with the large scoring area many pilots were unable to place their baggies in opposite quadrants. The Judge declared goal was at a county wetlands park that has become one of Clemons' favorite targets to use and pilots either love or hate this target. The target is set on a mowed lane that is at most 25 feet wide and is surrounded by waist to chest high grass, with scoring being 500 feet from center of the target but only in the mowed grass. The narrow scoring area always makes for some tricky scoring. The Hesitation Waltz gave pilots their choice of two targets with 300 feet scoring areas. The majority of the pilots flew to the northern most of the two targets. There were a lot of good scores over the morning however not many pilots hit all four targets. When the scores were posted topping the leader board was 1st Al Muir, 2nd Jason Jones, 3rd Tom Forenz. Clemons came up with a new tradition at this year's event to help the spectators keep track of who the front runners are. At the evening briefing the top 3 pilots were given basket banners that velcro on their baskets. The next evening the top 3 in the standings bring the banners in and present them to the current top 3 after that morning's flight. Pilots like the idea and many are comparing it to the "Yellow Jersey" at the Tour de France. Monday morning the winds had switched 180 degrees and the pilots were given a 4 part task that had some similarities to the previous morning. The tasks were Fly in Task, Judge Declared Goal, Judge Declared Goal, Hesitation Waltz. Many pilots launched from the location of the northern most Hesitation Waltz target from the previous morning. The Fly in target was located at the same wetlands but shifted further east along the mowed trail. Early morning fog in the wetlands area along the river was rather thick and caused many pilots to delay their launches to give the fog at the target time to burn off so that they were not dropping in on a target they were unable to see. Many pilots were able to attain good scores with some of the best scores coming from pilots who delayed their launch. The first of the Judge Declared Goals was located in a front yard and was a gravity drop. The winds were finicky all morning with the surface winds switching from being a right turn to being a left turn and back again multiple time over the morning. Even with the finicky winds many pilots were able to achieve good drops on the gravity. The second Judge Declared Goal was located at the main field, many pilots would work their way to the field just to have the winds switch and cost them a good score. The Hesitation Waltz gave pilots their choice of two targets, one being the same location as the first target from the previous morning, the second being located at a house that has been used as a target multiple times over the years. With the switching winds the first option became unattainable and pilots had to climb to around 2000- 3000 feet in order to make it to the second. Timing became critical on the final approach to the Hesitation Waltz as the winds had become very unpredictable on the surface varying by as much as 30 degrees depending on timing causing many pilots to miss the target to the left. At the end of the morning only one pilot, Brandon Bloom, had hit all four targets with many finding themselves just outside the scoring area on one target or another. The morning shook the standings up with many pilots jumping as many as 17 places in the standings. At the evening briefing the previous top 3 presented the banners to the current top 3 after 8 tasks, 1st Matt Fenster, 2nd Tom Forenz, 3rd Jason Jones. When Al Muir passed the 1st place banner off to Matt Fenster he added to the tradition by pinning ten dollars to the back of the banner and issuing the challenge to future holders of the 1st place banner to do the same with the final holder of the banner taking the pot. Showers moved through the area overnight and with them moved in a low ceiling that forced officials to cancel the morning meeting as the cloud deck was below 1500 feet and was not forecast to lift. Pilots awoke to another low ceiling and low visibility but this time it was forecast to lift. After the first hold pilots returned to fin a task sheet consisting of two tasks, Hesitation Waltz, Hesitation Waltz. At 8:00 after an hour and a half worth of holds the morning's flight had to be cancelled as the ceiling had not lifted enough to allow a flight. 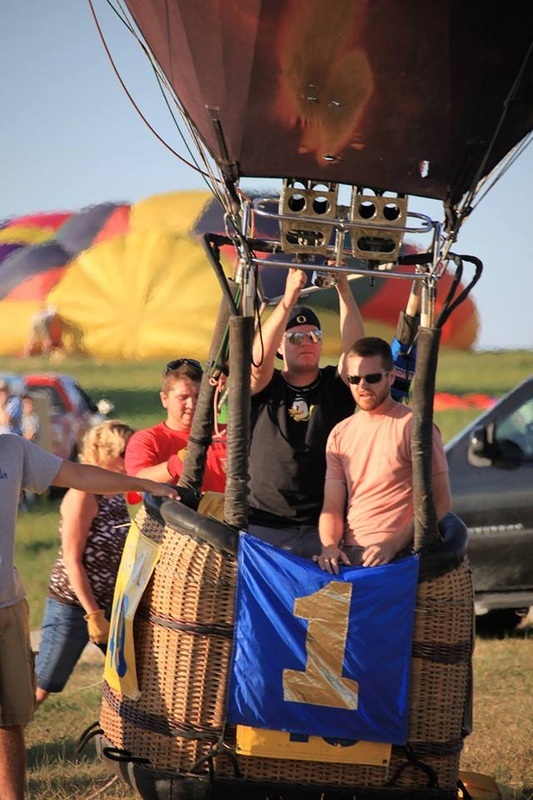 Indianola, IA will host the 43rd National Balloon Classic July 26- August 3rd. 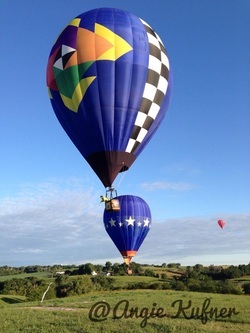 This 10 day festival in the middle of summer has rich history in the sport of competitive ballooning. It is here that many long-time competitors made the trek to the middle of Iowa to fly or crew for their family during the 70’s and 80’s as the US Nationals were held here from 1970-1988. Behind the podium at the Pilot’s Compound hangs a board of Champions at Indianola. Names such as Dennis Floden, Bruce Comstock, Sid Cutter, Steve Jones, Al Nels, brothers Johnny and Maury Petrehn, Joe Heartsill among many others are listed here. Competitors battle Sunday-Saturday to have the honor of being included on the board of Champions. 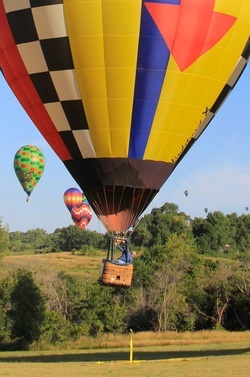 Indianola is also host to the Balloon Federation of America, The National Balloon Museum and the US Ballooning Hall of Fame. On Sunday the 28th, the US Ballooning Hall of Fame will induct three members: Denny Floden of Michigan, Bill Murtorff (Deceased), and Clayton Thomas of Massachusetts. Pilots look forward to flying this 10 day festival so rich in history every summer, but this summer has a little extra buzz as Staci Scheurenbrand has been named the new Executive Director of the Classic. Staci has brought new excitement to the Classic and re-energized the town. Pilots are hopeful that this means a return for Indianola to the big stage of competitive ballooning. This year’s classic will once again overlap with the US Nationals in Longview, TX. 7 US Nationals competitors will be praying for bad weather as they make the drive from Longview to Indianola in hopes of not falling in too big of hole in the overall standings for the Classic. The strong Iowa contingent of Brad Craig, Gary Haynes, Todd Isley, Scott Armstrong, Branden Bloom, Benji Clemons, etc. look to defend their home turf as defending champion Maury Petrehn, Andy Petrehn, Steve Jones, Jason Jones and Matt Fenster come to town in hopes of a victory. Bill Clemons will once again be calling tasks this year. The weather this year is looking surprisingly cool with high temperatures in the lower 80’s, a pleasant change from the usual mid 90’s. Competition starts Sunday morning, be sure to check back for updates throughout the week.